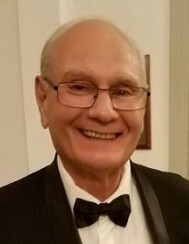 Eugene Victor Toy, Jr., 69 passed away early Tuesday morning, March 26, 2019 surrounded by his loving family. Mr. Toy was born on June 12, 1949, a son of Eugene V. Toy Sr. and Correne (Regas) Toy. Gene was a graduate of North Lima High School. He married the former Linda Cary Bregar on December 9, 1967, and together they would raise four children. Eugene spent more than 50 years in the IBEW Local 64 and was employed for thirty years at Dickey Electric. He was an electrical inspector for CIB and OCIB. He was an outstanding athlete who won many awards for his accomplishments. Gene was a proud member of the North Lima High School (now South Range) Athletic Hall of Fame. In his free time he enjoyed spending time with his family, playing golf and softball, and fishing. In the 1970’s and 80’s Gene played travel softball for Scaffidi’s. He was also a member of the Allen Masonic Lodge #276 and the Youngstown Shrine Club. He leaves to cherish his precious memory his wife Linda of Canfield, with whom he recently celebrated 51 years of marriage; his children Victoria (Tim) South of Waverly, Nicholas (Erika) Toy of North Lima, Melinda (Travis) Marriotti of Canfield, and Tracey (Chris) Wikoff of Avon, CT; his grandchildren Haylee, Hunter and Savannah South, Nicholas Jr., Victor, Taylor, and Khloe Toy, and Alex and Ava Wikoff; his siblings John (Sandy) Toy, Jenny (Dana) Vickers, George (Carrie) Toy, Chris (Lisa) Toy, and Tony (Chris) Toy. Mr. Toy was preceded in death by his parents. Funeral services will be held on Friday, March 29, 2019 at 11:00 a.m. at Seederly- Mong and Beck Funeral Home in North Lima. The family will receive friends on Thursday, March 28 from 5:00pm – 7:00pm at Seederly-Mong and Beck Funeral Home, 11500 Market Street, North Lima, and from 10:00am-11:00am on Friday prior to the funeral service. The family has entrusted Seederly-Mong & Beck Funeral Home in North Lima, Ohio with the arrangements for their loved one.